Why does temperature increase as height increases in the stratosphere (15 km - 60 km above earth), when the ozone molecules are most concentrated at about 25 km? There are two main points to make here. 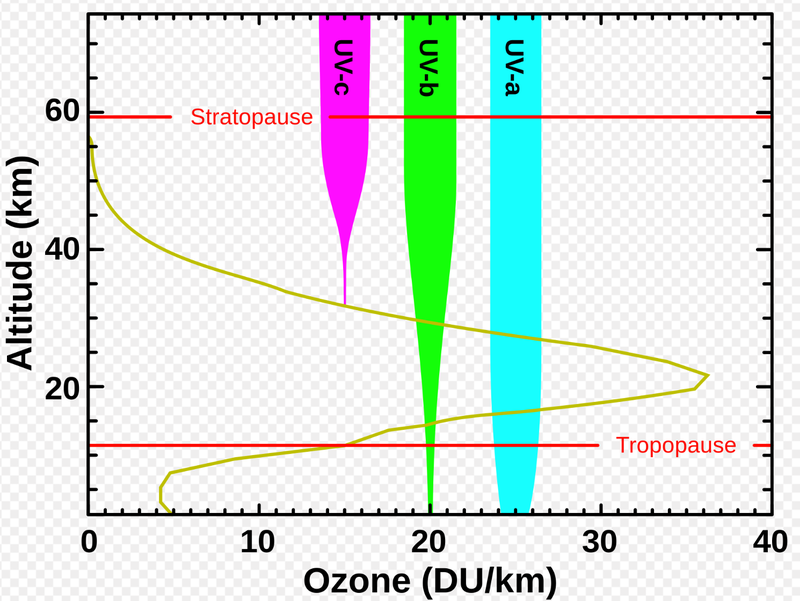 The first point is that UV radiation is entering the stratosphere from above (ignoring angular dependencies and scattering), so is preferentially absorbed by ozone higher in the stratosphere. This is a form of the Beer-Lambert law, which leads to greater absorption higher in the stratosphere. 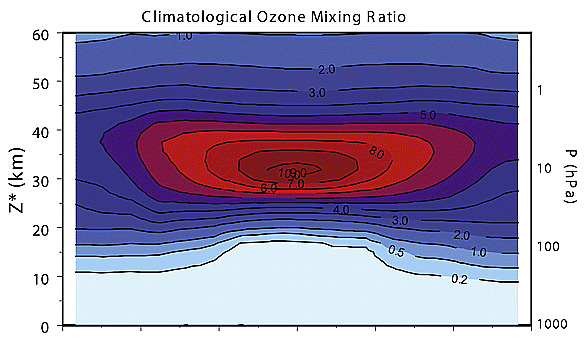 A height–latitude cross section of annual average ozone mixing ratio (ppmv) from the climatology. Source: McPeters et al (2005), Ozone climatological profiles for satellite retrieval algorithms, GRL. While the ozone concentration peaks around 20 km, the mixing ratio peaks around 30 to 40 km and doesn’t decline so abruptly with height. Where the mixing ratio is greater, absorption of a particular amount of UV radiation can have a greater effect on the overall air temperature at that height. The net effect of these two properties is that heating of the stratosphere by UV absorption (see plot below) peaks in the upper stratosphere around 50 km. This is why the greatest temperatures are found in the upper stratosphere. 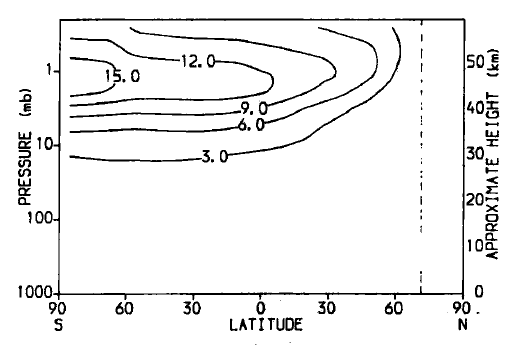 Source: Haigh (1984) Radiative heating in the lower stratosphere and the distribution of ozone in a two‐dimensional model, QJRMS. Not the answer you're looking for? Browse other questions tagged temperature atmospheric-chemistry ozone stratosphere or ask your own question. How to reduce the atmospheric temperature artificially? Does the Antarctic Ozone Hole affect the rest of the world? How can ice crystals with adsorbed chlorine remain over the south pole all winter?